The GS110 gas-fired, sealed combustion boilers offer outstanding performance. The GS110 is vented to and from the outdoors to use 100% outside air for combustion rather than air from within the home. This increases operating efficiency and provides safe dependable operation. 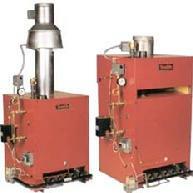 The GS110 boilers are available from 70-210 MBH with efficiencies up to over 86% AFUE. 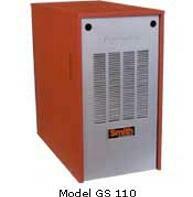 The GS110 uses a unique burner that premixes the gas and combustion air through a sealed blower which delivers the air-gas mixture to a ceramic down-fired burner. Combined with electronic ignition pilot, the results are assured light-off, a stable flame and complete combustion with low emissions. � Due to the larger water content and increased surface area in the boiler, corrosion and mineral build-up is minimized while the heat transfer is maximized improving longevity and increasing efficiency. � The higher boiler mass maintains a high water temperature for a greater length of time after the burner has stopped firing. 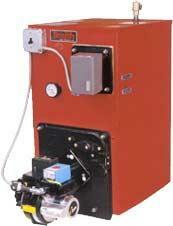 This higher heat retention reduces short cycling and stress on the boiler improving reliability. � The larger combustion chamber allows more room for the combustion process providing better, cleaner combustion for low emissions. It decreases the chance of flame impingement with its potential for incomplete combustion and sooting.